Stir together. Press into 2 mini muffin pans of 24 each. Bake 14-15 minutes. Makes 48 minis. Grow flowers, Eat cookies, Be Happy! Caldo Verde (green soup) takes advantage of abundant, colorful winter/spring vegetables. It is fast and easy, and so beautiful you would be proud to serve it at your next dinner party. If you are a stranger to kale, this is the time to try it out! Among the list of “super foods”, kale is truly the most nutritionally dense scoring a 1000 on the Aggregate Nutrient Density Index (ANDI). The recipe is below. Click here for an easy to print .pdf version: Caldo Verde.pdf I hope you enjoy it as much as I do! In a large Dutch oven or heavy pan, brown the sausage and drain. Add onion and cook about 3 minutes until soft. Add garlic, carrots, turnips, chicken broth, oregano and pepper. Cover and simmer 10-15 minutes or until carrots are barely tender. Add kale and cook about 8 – 10 minutes longer so that it is tender but still bright green. Remove from heat and serve immediately. Organically grown greens like Collards & Kale are packed with more nutrition than almost any other vegetable! Even if you were never a fan of collards, you may be very surprised by this appetizer from the “Taste of Thai” restaurant (Westover Terrace & Mill Street in Greensboro.) It is sort of like a lettuce wrap, only with 4” squares of fresh collard leaves! 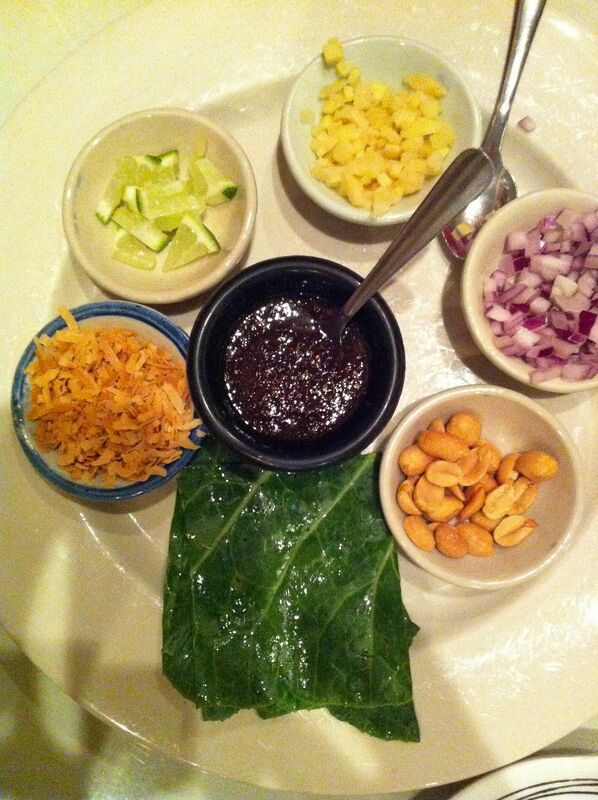 The idea is to set a leaf in the palm of your hand and fill it with a little of each of the condiments below, add a drop of sauce, then roll it up and eat it. Forget trying this with lettuce – nothing really nothing works as well or tastes as good as a deveined collard leaf! Here is what’s in each little dish: peanuts, tiny pieces of fresh lime (including the rind), unsweetened coconut, fresh chopped onion and ginger root. I guessed at the sauce, but about half Hoisin sauce and half Asian Sweet & Sour sauce is perfect. Each bite is such a burst of flavor, you cannot believe it could be so good for you! Surprisingly, Kale can be delicious when eaten raw too. This salad makes the perfect lunch! Remove ribs and tough stems from Kale and tear into 1” to 2” pieces. Add dressing to kale and “massage” it with your hands until it is thoroughly coated and kale is wilted. Add remaining ingredients. Serve cold. This makes a big salad that keeps a few days in the fridge. Preheat oven to 350 degrees. Lightly grease & flour a 10-inch spring form pan. Sift together first 6 (dry) ingredients. Set aside. In a separate bowl combine sugar, oil, orange zest, vanilla & eggs. Mix well. Stir in the shredded zucchini and buttermilk. Add dry ingredients to the zucchini mixture. Mix well; do not beat. Stir in chocolate chips. Pour into prepared pan & bake about 35 or 40 minutes or until a wooden toothpick inserted in the center comes out clean. Cool about 20 minutes before removing from pan. When cake is completely cool, dust with powdered sugar. Serves 8-10. My favorite Cucumber Soup – This recipe was shared by my friend Inara Zandmane after she served it for dinner. I have made it (over & over again) every summer since. It is amazing that anything so healthy can taste this good! I hope you love it too. Combine all ingredients. Garnish with whatever fresh herbs you have in the garden – minced mint, chives, dill or parsley. Serve cold. This keeps several days in the refrigerator and is totally refreshing after a hot day in the garden! Here is Jim’s favorite way to eat squash – disguised in a yummy casserole that tastes similar to corn pudding. Combine all ingredients. Pour into a shallow greased baking dish (a 9”x13” or 10” round works well). Bake at 350 degrees for 45 minutes. This is equally good reheated the next day.